A $30 bln-plus merger of the two grain traders would boost profit in an unhelpfully oversupplied market. It would, though, also give rival Glencore, regulators and farmers a chance to push their own recipes. A single, clean takeover isn’t likely – but a few smaller ones could be. 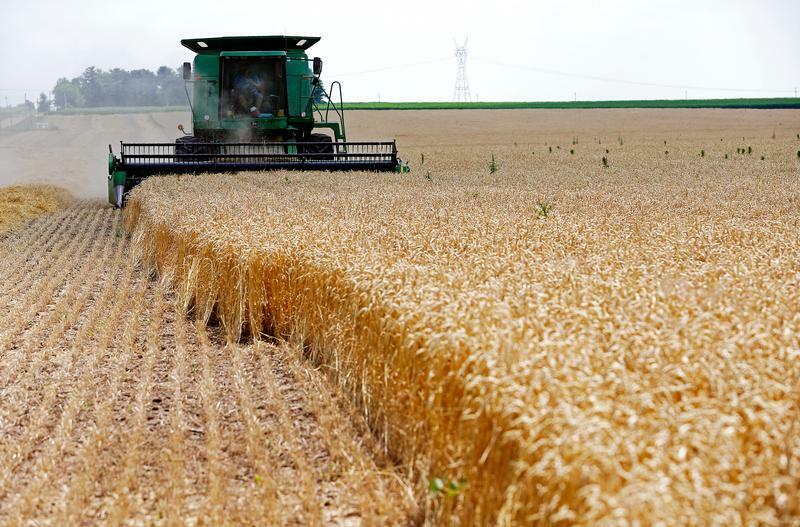 A combine drives over stalks of soft red winter wheat during the harvest on a farm in Dixon, Illinois, July 16, 2013. Archer Daniels Midland has proposed a takeover of rival grain trader Bunge, Reuters reported on Jan. 19, citing a source familiar with the situation. Both companies have reported adverse effects of bumper harvests in the foodstuffs they process and ship. Soren Schroder, Bunge’s chief executive, described the previous year as “humbling,” as he reduced the company’s estimate for full-year earnings in November. Glencore made an informal approach to Bunge about a merger in 2016. The company responded by saying in May that it was not engaged in business combination discussions with the Swiss trading house. Bunge had a market capitalization of $9.8 billion when the market closed on Jan. 18. Its share price rose by 11.3 percent the following day.